The town of Mound House started out as a stop on the wagon road between Carson City and Dayton. Originally it was called Mound Station, named for the mounds of gypsite in the area. In 1869 the V&T Railroad was built through this wide plain on its way up to the Comstock, and the wagon stop naturally became a railroad stop. At first it was a transfer point for wagons headed to Dayton, but then in 1880 the Carson and Colorado Railroad was built. 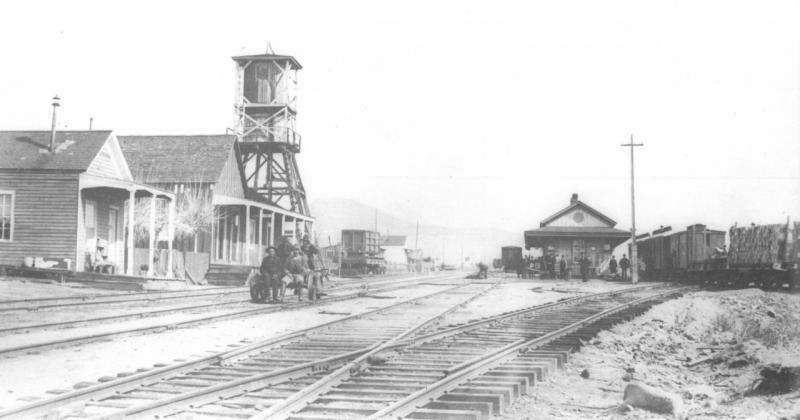 This narrow gauge railroad had its terminus at Mound House and went to Dayton, Mason Valley, Hawthorne, and ended in the Owens Valley south of Bishop. After this Mound House became a much more important transfer point, for freight and passengers headed to all points south. Because of the different gauges involved, switching freight at Mound House was a complicated procedure. In the photo above you can see the two lines that came close without ever exactly meeting. On the left is the standard gauge V&T Railroad, with a section gang waiting on a handcar. on the right is a C&C train, loaded with freight for its 300-mile journey to California. The passenger depot is in the center, with a platform on each side depending on which train you were getting on. Hidden behind that is the freight depot. The spur line curving to the right heads to one of the many transfer point in the yards here. In 1899 the Southern Pacific purchased the C&C Railroad, and soon after that the gold rush to Tonopah and Goldfield began. The C&C, which just a few years before had seemed like a costly mistake, suddenly was the best way to get to the new bonanza in the south. Mound House became very busy, since all SP traffic had to pass over the V&T between Reno and Mound House before transferring. This time of heavy traffic in Mound House didn’t last long, though. The SP didn’t like the fact that their trains had to travel over V&T tracks, and pay the corresponding fees, to get to Mound House and the C&C (now called the Nevada and California Railway). So they laid down new tracks to bypass the V&T, across the desert from Hazen to Fort Churchill. This new track was called the Hazen cutoff, and once it was completed in 1905 it did cut off most of the traffic through Mound House. The C&C tracks were pulled up soon after, and Mound House once again became just a stop on the way to Virginia City. 30 years later demand for a railroad to VC was almost non-existent. 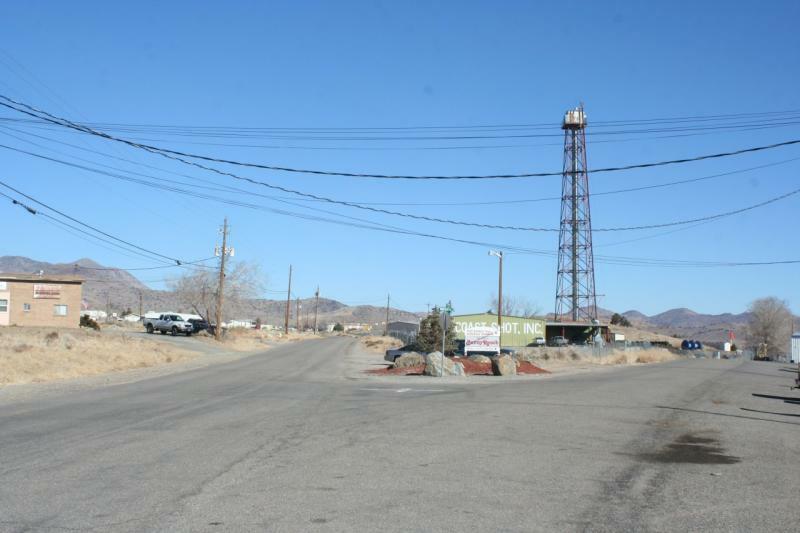 The V&T got permission to shut down the Virginia City line. The last trains rolled through Mound House in 1938, and the remaining tracks were pulled up in 1941 for scrap. In the decades since the V&T left Mound House, everything has changed. Every building seen in the historic picture has been torn down. The old railbed was well-graded enough that it became a road, which was later widened and paved. Mound House became an industrial center, and all traces of the railroad wiped out. Here at this junction, though, you can still see one faint remnant of the old layout. On the left is Red Rock Road, which follows the path of the old V&T. breaking away to the right is Moonlite Road, the path to the infamous Moonlite Bunny Ranch. This road is built on the grade of the old spur line that used to curve away here. On the site of the depot is West Coast Shot, Inc., an ammunition manufacturer. Their tall shot tower faintly echoes the water tower that used to sit on the other side of the tracks. The V&T is returning to Mound House, in the form of the Virginia and Truckee Reconstruction Project. This part of town has become too built up, though, so the rails won’t be following their original path. Instead they’re skirting around town to the west, hugging the foothills. So once again Mound House has been bypassed by the train.